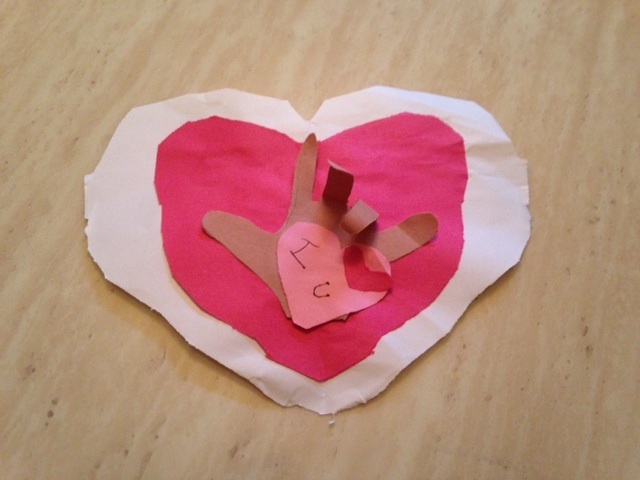 She started out by letting Shaan cut out hearts by himself. We’ve been trying to work on “cutting” with Shaan since, at his mid-year parent-teacher preschool conference, the teacher mentioned that he had a habit of holding the scissors incorrectly. So, we’ve been “cutting” a lot lately to correct his grip. Next, mom traced Shaan’s hand and cut out his “handprint.” She then let Shaan fold down the two middle fingers to make the “I Love You” sign in sign language. After everything was glued together, we have a pretty neat and meaningful craft (primarily prepared by Shaan). This craft is unique because it gave us a chance to explain what sign language is, and that God made all people differently (and that sign language is a means of communication for people with difficulty hearing). Just thought I would pass it along as it’s super easy to create! Hope you and your little ones enjoy!